Butternut Squash Chocolate Brownies – yes really! Chocolate brownies are one of my vices, whenever I’m out and there’s a pudding option, I’ll always go for the chocolate brownie – especially if it involves lovely vanilla ice cream! There’s something about those chocolate chewy morsels that just make them addictive in my mind. I adore them. 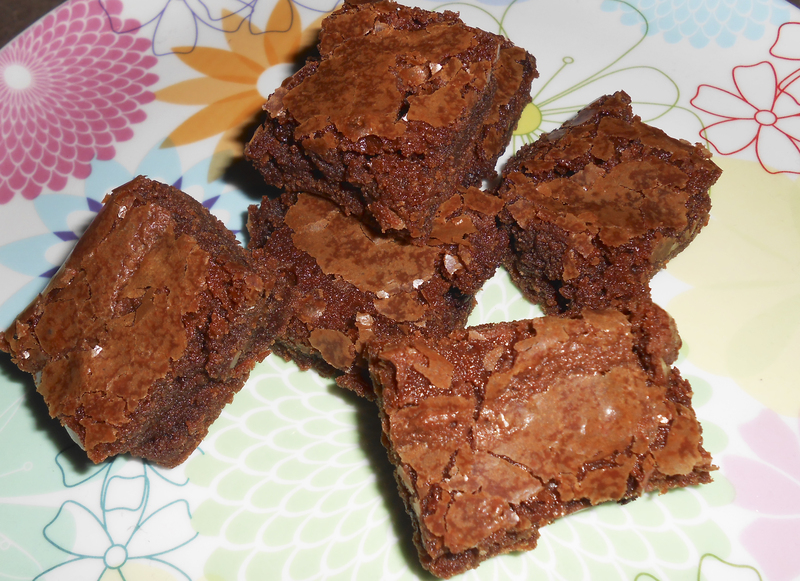 So when I saw this recipe for healthier brownies, which contain butternut squash – yes really! – I was intrigued enough to make them. I mean if I’ve found a brownie that’s only 50 odd calories each, then just imagine how many of those I could eat a day!! Leave to cool in the tin for at least an hour before cutting into squares and eating! The one thing to note about them is that they are quite cakey, and aren’t that chewy, but I don’t think that’s necessarily a bad thing. I like variation in my brownies after all! As Lau’s already mentioned we decided to celebrate the brilliance of the Great British Bake Off with a Bake Off Send Off full of lovely creations. It seemed only fair that we celebrate the last 10 weeks of brilliance, from Mel, Sue, Paul, the genius that is Mary Berry and of course the finalists themselves, in some special way – and baking seemed the most fitting! So we all made different creations, check out this photo of all our sweet creations – what do you think? 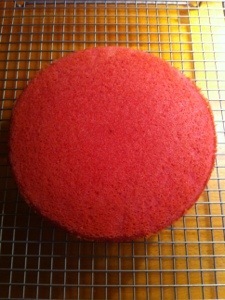 The top layer just out of the oven! 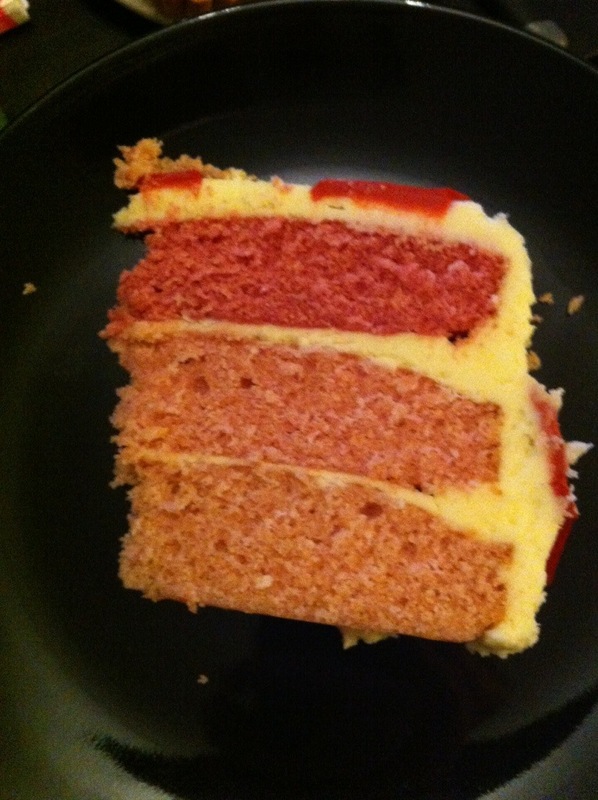 Divide the cake batter equally between three bowls and add food colouring to achieve the right colour for each layer. I used about 30 drops for the brightest pink layer, then 20 and 15 drops for the other layers. Although in hindsight I wish the bottom layers had been more different in colour, so perhaps 20 and 10 drops are a better suggestion for the lighter layers. So after I’d decided on the layered cake idea and made my three sponges, I was only left with the question of decoration. 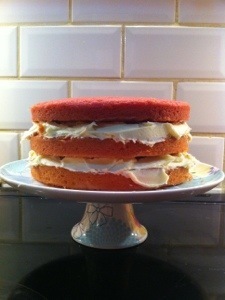 After a lot of deliberation I decided to keep it simple with butter icing and fondant icing. So first off I made a load of butter icing by combining a LOT of butter and icing sugar (about 400g of butter 750g of icing sugar) with a splash of milk until smooth. This was the first time I’ve used icing sugar rather than caster sugar for butter icing and it made a much smoother icing, so I’d definitely recommend doing that in the future. Once I’d covered the entire cake with the icing I pressed some black and red fondant icing hearts onto the surface of the cake. 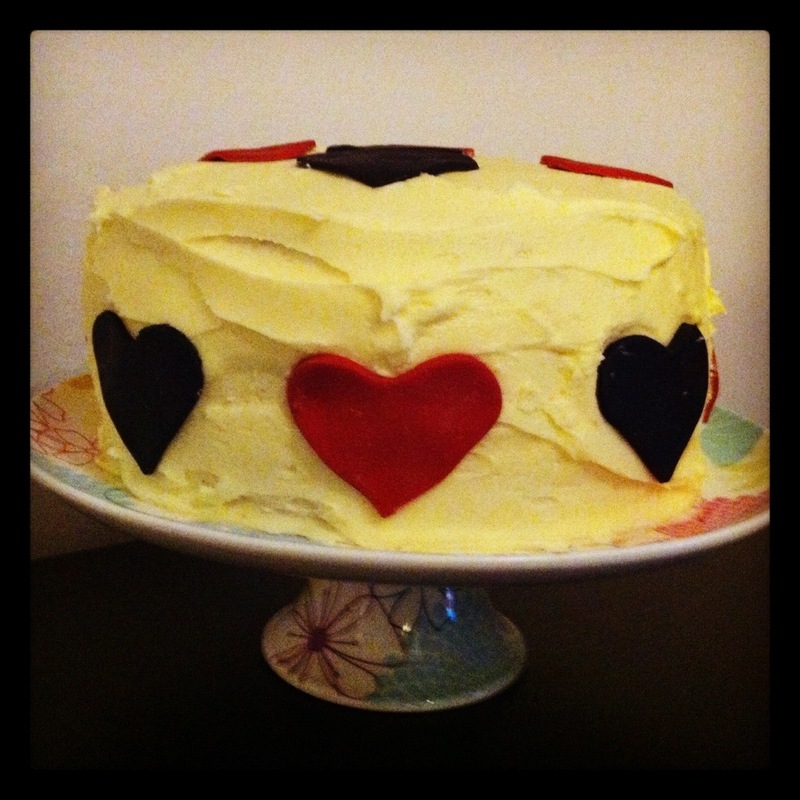 This reminded me a bit of the Queen of Hearts from Alice in Wonderland but it also served to show my love for the bake off! 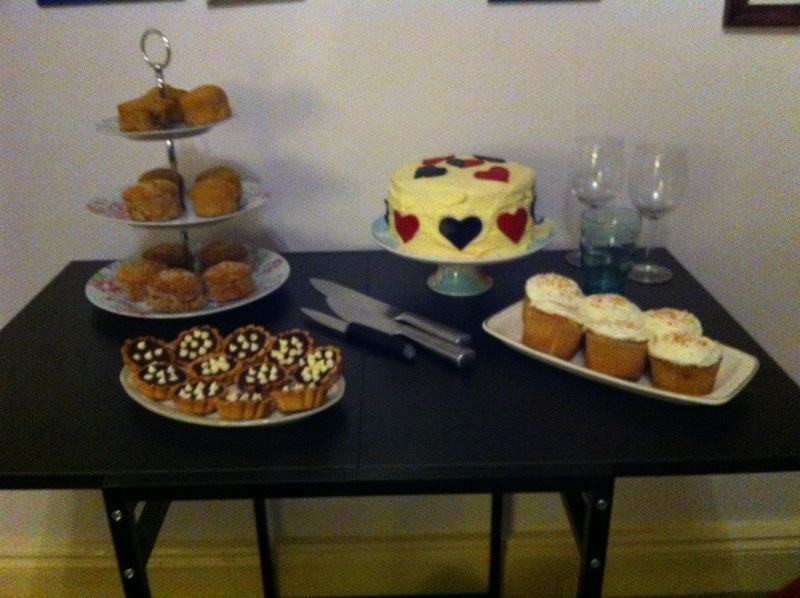 The hearts were made out of Dr.Oetker Coloured Ready to Roll Icing, which worked perfectly. I was quite pleased with my decoration, not only was it easy to create, which was imperative after baking three different sponges!, but it also made the cake look really simple and I liked the contrast that created when the cake was cut and everyone saw the three different coloured layers of cake. Hopefully, you all agree that the decoration is simple as well as special considering the occasion! So both Lau and I are big Pinterest fans and we both have boards filled with food items that we one day plan to make, but we don’t always get round to actually making the things we pin. It’s ofter more a case of ‘one day’ rather than ‘right this second’. But when Lau pinned this peppermint chocolate brownies recipe we were both in agreement that we were making them asap, not just because we’re both massive brownie fans (case in point our Scrumptious Brownies recipe) but also because we are both obsessed with mint chocolate, whether it’s chocolate bars, ice cream and now brownies!! So three days after Lau pinned the recipe we got baking and thank goodness we did because they are delicious. Even now as I nibble on one four days later they are still scrumptious and deliciously minty. Weirdly I get a surprise every time I take that first bite as I keep forgetting they aren’t ‘normal’ brownies! So the minty goodness at that first bite is a lovely surpise! The recipe makes about 18 brownies, but we wanted to make the brownies last longer so we made about 35 smaller brownies – the perfect guilt free treat! Grease and line a brownie tin – we used one that was 23x26cm, which in hindsight was a little too big for the mixture. Melt the butter and chocolate in the microwave for 1 minute and stir until smooth. Add the sugar, eggs, vanilla extract and peppermint extract and stir until properly combined. Add the flour and a pinch of salt and mix in. Pour into the tin and place in the over on the middle shelf. Bake for 40–45 minutes (or until a skewer comes out clean when inserted in the centre). 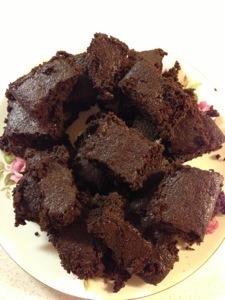 Cool completely in tin, then remove from the tin, cut into squares and enjoy! We enjoyed these so much that we’re now searching for other flavours of brownie. We’ve eaten Orange Chocolate Brownies before which is another winning combination but we know there must be other ones out there. So expect a smorgasboard of other brownie delights in the not too distant future! When it comes to puddings I never choose the fruit salad. It’s all about comforting food like sticky toffee pudding or apple crumble with me! But considering this love of such desserts, weirdly I’ve never made any of these puddings myself. They’ve always been made from others or they’ve been shop bought. I’d been meaning to make a pudding like this for a while, so when I saw this recipe for a variation on bread and butter pudding I knew I’d have to try it and considering it was around Easter, it seemed like the perfect time to give it a whirl! And I’m glad I did because it’s delicious! 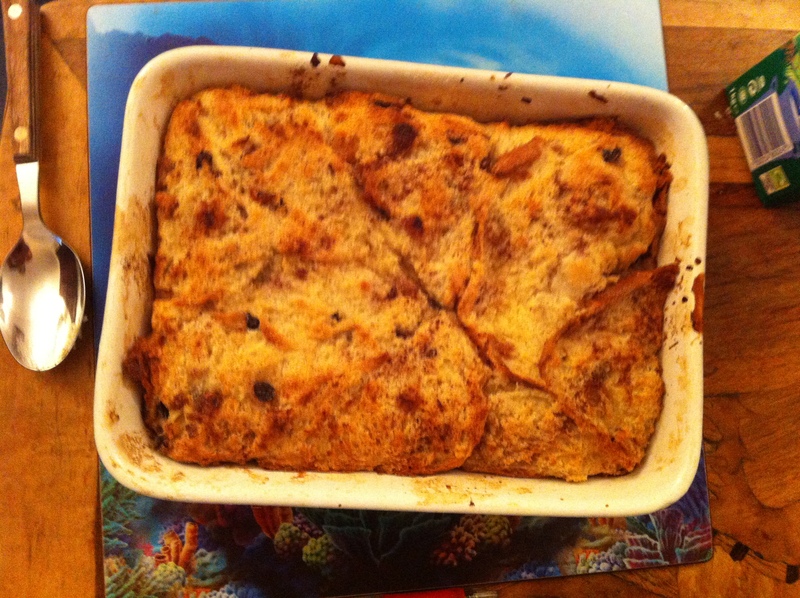 I defy anyone not to love it as much as, if not more than, a classic bread and butter pudding! Grease a serving dish with butter (1 litre in size). Spread the hot cross buns with the remaining butter and cut in half diagonally. Then place butter side up in the dish so that the slices overlap one another. After doing one layer of hot cross buns sprinkle them with nutmeg, cinnamon, raisins and sultanas. Repeat until the dish is filled and then sprinkle the remaining raisins and sultanas on top. Next heat the milk and cream in a saucepan making sure it doens’t boil. Beat the eggs with 3/4 of the sugar and the vanilla extract until pale in colour and light and airy. Add the milk to the eggs and beat until combined. Pour the egg mixture over the bread until all the liquid is added and then press the surface so that the bread goes into the liquid. Sprinkle the remaining sugar on top and leave to rest for half an hour. Bake the pudding for 40-45 minutes on 180 °C until golden brown, well risen and the egg is set. Serve hot with ice cream or custard. Yummy! There’s nothing better than cupcakes, it’s just one of the facts of life. So it’s about time that we added this recipe to the blog. We always make cupcakes, it’s just the topping that changes; sometimes we’ll do frosting, sometimes buttercream and often with no topping at all. As let’s be honest sometimes all you need is the cake! So for our first cupcake recipe on the CookBakeandEat blog we choose a raspberry frosting which is super easy to make and absolutely delicious. I think I could eat this every day of the week! Now decorate (raspberrys and chocolate buttons work particularly well)! Now I hate sherry, in fact I pretty much hate every type of alcohol in existence unless it’s masked by a gallon of orange juice or in an (orange juice based) cocktail! But this sherry log is one of my favourite puddings ever and it’s always my job to make this each year on Christmas Day for the big family gathering that takes place on Boxing Day. There really is not an easier and more scrumptious pudding out there and I promise even if you hate sherry you’ll love this! Case in point this is the first pudding to be finished on Boxing Day beating even the Banoffie Pie! Start by pouring the sherry into a cereal bowl (until about an inch deep). Whip upthe cream until you have stiff peaks of cream. Take each ginger biscuit and dip it in the sherry so both sides are moist. Spread one side of the biscuit with the cream. Sandwich the biscuits together on a plate to form a ‘log’ shape’. Continue dipping, spreading and sandwiching the biscuits until you have the desired ‘log’ length. Spread the remaining cream over the biscuits and down the side so it resembles a snow-covered log. Sprinkle the top with chocolate shavings. Place in fridge for a couple of hours to properly set.